This App acts as an integration tool to a Domoticz Server in your local network. 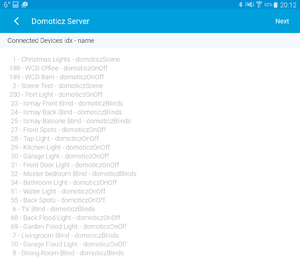 Domoticz is Open home automation software that is frequently installed on a Raspberry Pi. Domoticz can be downloaded in combination with the Raspberry OS onto an SD card and used to start the Rapberry Pi, nothing complicated. Zwave is supported through openzwave on the Pi. The App will look every hour for new devices in Domoticz. When a device in Domoticz is deleted it will be deleted in SmartThings as well. When you copy the code enable OAuth in the IDE for this app as well! 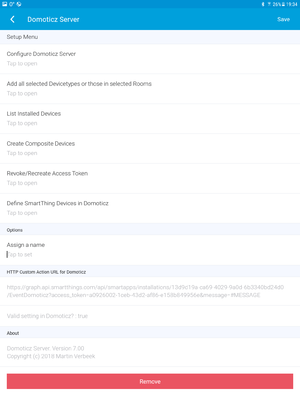 Before adding devices to Smartthings you should whitelist the local network you are using in Domoticz. If not, the sendHubCommands that are send locally from Smartthings to Domoticz will not be accepted by Domoticz. 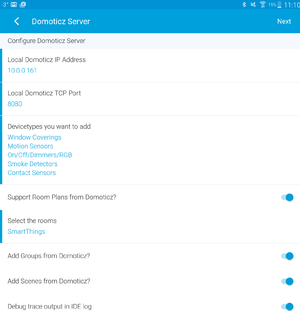 To initially setup the Domoticz Server tap the configure Domoticz Server menu item. It will open the next Menupage. When this is completed, tap the Add all devices of a type menu item. It will execute the command to retreive the information from Domoticz. To create a device that consists of multiple source devices from within Domoticz, Create Composit Devices. This can currently be used on the following base devices in SmartThings, Temperature Device, Thermostat Device, and a Motion Sensor. For special cases where you experience problems with updating status within Smartthings you can get a new access Token. This is done with the Revoke/Recreate Token. It will execute the command immediatly! Device types you want to add. 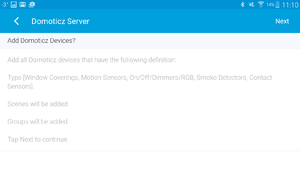 You will have a choice of "Window Coverings", "On/Off/Dimmers/RGB", "Smoke Detectors", "Contact Sensors", "Dusk Sensors", "Motion Sensors", "(Virtual) Sensors"
If you have define Groups in Domoticz it will add these as a switch device in Smartthings. 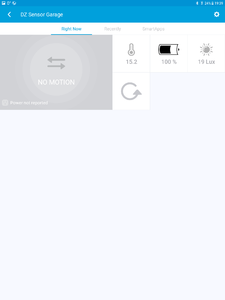 If you have define Scenes in Domoticz it will add these as a switch device in Smartthings. Be aware that only ON commands are executed against Scenes. This will output extensive debug information into the IDE Live Logging. The first page will show the devices that are eligible for selection to be a composite device. When you click on Add Capabilities it will show the next page where you can add the different capabilities that are available to this device. The source devices and sensors are in Domoticz and include all devices including devices that are set as UNUSED in Domoticz. You will see an image that represents the type of base device you are adding capabilities to. Utility Reporting Devices, Temperature devices, Motion Sensors and Thermostat devices. MOTION BASE. This is an example for a composite device that add other capabilities, in this case it was originally a Hue Motion Sensor, this sensor is split up in different devices in Domoticz, a Lux and a Temp component. As you can see it is reassembled into one device again in SmartThings. You can also add a capability that report Power Usage. THERMOSTAT BASE. This is an example for a composite device that add other capabilities, in this case it was originally a Nefit Thermostat. You can add Humidity, Power Usage and Gas Usage devices to the Thermostat base. You can select Domoticz Selector Switches as a source for allowed Fan Modes and Thermostat Modes. This is based on the Daikin implementation in Domoticz. If you need you can define virtual selector devices yourself in Domoticz to define these modes for Fan and Thermostat. The selector device will be defined by the app as a MultiState button device in SmartThings. When you assign this switch in this screen you are able to automate and control the modes of the Thermostat. Below you will see an example of the Selector device in SmartThings and and Example of the Thermostat Device. TEMPERATURE SENSOR BASE. This is an example for a multisensor device. Select the type of other sensors you want to add. 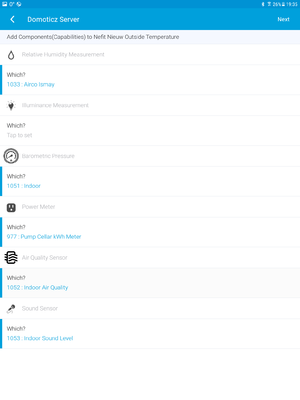 You can also add two types of custom sensors (type=general) from Domoticz. UTILITY REPORTING DEVICE BASE. 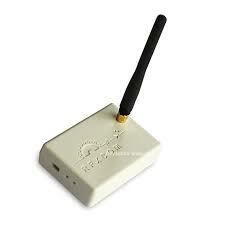 This is an example for Power Reporting device. Select the type of power sensor you want to add. 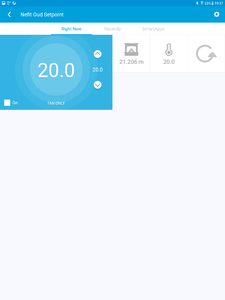 When you connect a Domoticz sensor or devices to report on the power consumption, it is intended for devices that monitor the total household consumption and usage. But any sensor or device that reports kWh or gas will do. You have not enabled Notifications in Domoticz, either on the device itself or as a system setting. This app is aiming to control different type of window coverings that must have the windowShade capability. Controls can be based on weather conditions like Sun, Cloud cover, Wind and Temperature. Control can also be based on Airco operating mode. The app will get your country based on the location of the hub and will apply the metric system in use for that country. It allows you to choose a specific weather API provider, DarkSky, OpenWeatherMap or WeatherUndergound (including PWS or exclude PWS) it will find the nearest for your Hub location. 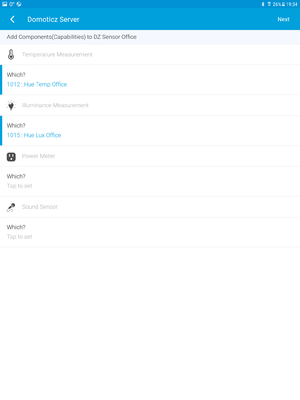 As an add on it allows for selction of a Netatmo device to provide wind data for the app. The App will calculate the position of the Sun, it will be used to see if your coverings need to be operated when the sun is shining (actually it looks at the amount of clouds that is forecasted). This will be evaluated every 30 minutes. The App will reverse the operation if the cloud cover is above your defined percentage this will evaluated every hour, this will prevent shades reversing the operation too many times. The App will check for wind speed and direction every 10 minutes and reverse operation if you have outside screens that can be damaged if wind is above a certain speed. If wind direction is not window covering direction no action is taken. The opposite is also true for roller shutters, that can provide protection when winds are high. The app can operate based on outside and inside temperature to keep things cooler inside. This will only work if you enable it and define outside temperature limit. You can also define inside temperature limits by selecting temperature and sensor that provides the data. Control will only be done when cloud cover is below a predefined percentage. The app can control coverings based on a selected Airco going into an operating state of "cool", when it happens all other controls are bypassed (apart from wind protection). This behaviour is cancelled when the mode is changed to something else as cool. Coverings can be protected against windows or door opening, select the related contact and control will not be done when it is open. Forecast Weather You can make a selection out of WeatherUndergroup (with or without Personal Weather Stations- PWS), without PWS usually gives a professional weather station nearby. Alternatives are DarkSky and OpenWeatherMap. You need to obtain an API key to connect to these services. By tapping on the field below the API key you will be brought to the page you need. When registered, copy paste the requested key in the app field. For increased safety you can select to have the next hour of forecasted wind data interpreted as well, when you do the app bases its wind decisions on speeds from both current and the forecasted data, the highest wins. 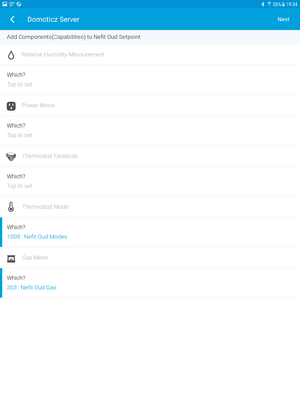 Netatmo Interface When selected you will see all devices with a capability of sensor, this can be many devices, select the ones are the windmeter devices from Netatmo. You can select multiple, the wind speed and direction are being used as the data to decide upon. Select Window Shades Here you select the devices you want to control using this app. Configure Window Shades These are the devices currently under control of the app, when you tap it, a page will be shown where individual definitions can be made. Enable Temperature Protection When selected, the app will also take temperature into account when operating the shades. 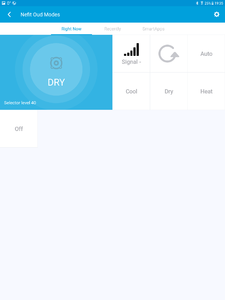 Act above Outside temperature Provide a number, when the temperature outside rises above this the app will execute control defined on the individual blinds. When no control is defined, no action takes place for temperature. Act above Inside temperature (default) Provide a number, when the temperature inside rises above this the app will execute control defined on the individual blinds. When no control is defined, no action takes place for temperature. Cloud Cover The current forecasted cloud cover needs to be below this to have temperature control kick in. Off Season definitions Scheduling of the operations will be suspended during the defined period. Environment Info See a page internal definitions for forecasted conditions. Also you will see under temperature how temperature conditions are being evaluated. 'Types' Define the type of window Shade. Inhouse screen is not affected by wind, same goes for outside roller shutter. Screen type (outside) is affected by wind and could be damaged by high winds. Roller shuuter can provide protection against high winds. 'Select Orientation' This is the orientation the window is facing, looking out to. 'Related door or window contact' Is there a contact sensor that will report open/closed. If open it would interfere with the operations of the shades. So if you define one, the operations are halted for this window shade until closed. 'Action to take' What operation to carry out for protection against sun. 'Below Cloud Cover' Operation until what forecasted cloud cover, if above the action will be reversed. This will be checked hourly. 'Wind Protection' Perform the operation entered when window shade type is shutter when the wind speed is above the value entered. 'Action to take when outside temp' What operation to carry out for protection against outside temperature. 'Logic AND/OR' Operation until what forecasted cloud cover, if above the action will be reversed. This will be checked hourly. 'Select inside temperature sensor' Perform the operation entered when window shade type is shutter when the wind speed is above the value entered. This page was last edited on 28 January 2019, at 10:49.